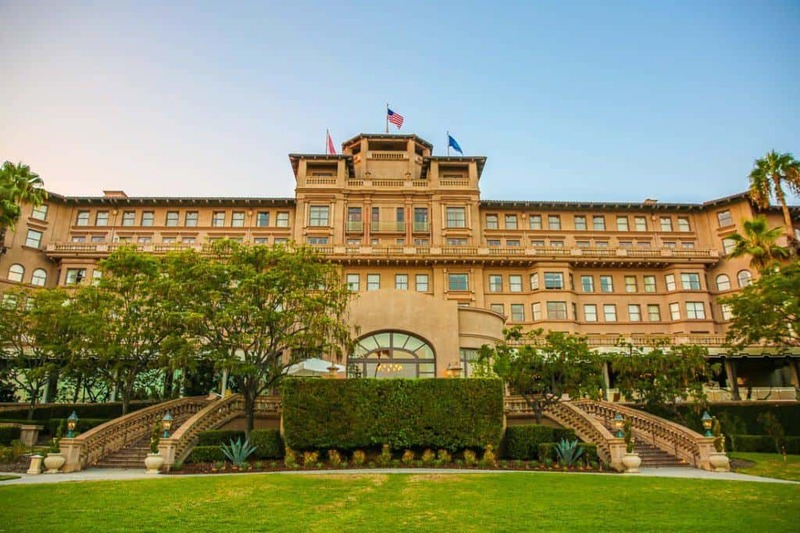 The Langham Huntington is more of a suburban hotel, popular for weddings, stay-cations, and business travel, but for those who enjoy exposing their children to art, design, and history, it’s the perfect complement for a southern California itinerary. If anyone is a regular reader of this site, my passion for historic hotels is no secret. Who goes to Los Angeles to check out historic hotels? This mom. The lobby of the Langham Huntington leads to a beautiful atrium area with gardens. We found our stop at The Langham Huntington (check your dates for rates) to be the perfect finale to a Southern California vacation. After we experienced Beverly Hills and Santa Monica, we headed inland to the Rose Bowl suburb of Pasadena, a few miles east of Chinatown and downtown Los Angeles. The original hotel built in 1906 was doomed its first season because the San Francisco earthquake of 1907 consumed all area laborers to repair the city. Henry Huntington, whose family fortune was is railroads, bought the hotel and created the structure and resort we see today. The public spaces are a wonderful fusion of traditional and modern design, particularly the restaurants and lounge areas. But the original hotel proved not to live up to code. 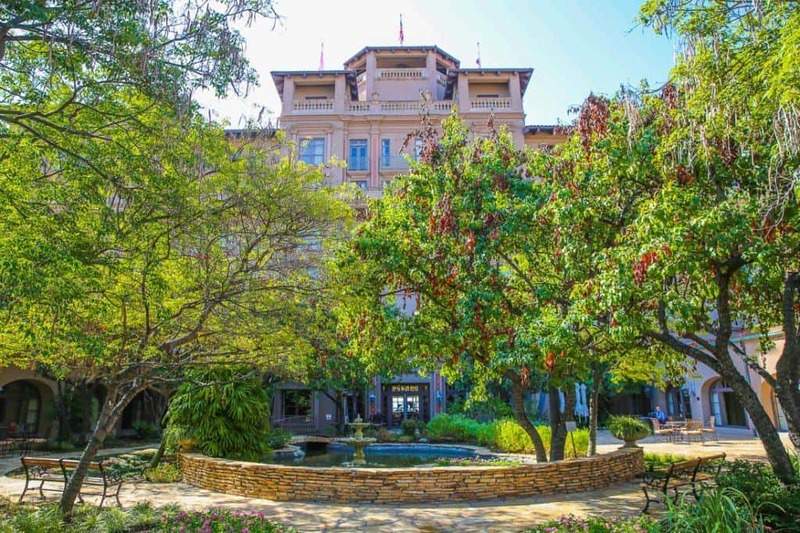 After intensifying fears from the 1985 earthquake in Mexico, the city of Pasadena decided to raise the original part of the hotel that tested unstable, and rebuild a modern replica of the property to attach to the original ballrooms. Huntington himself, whose fortunes in railroads contributed to the development of Los Angeles. Gold leaf ballrooms from the original hotel are now attached to a modern replica. 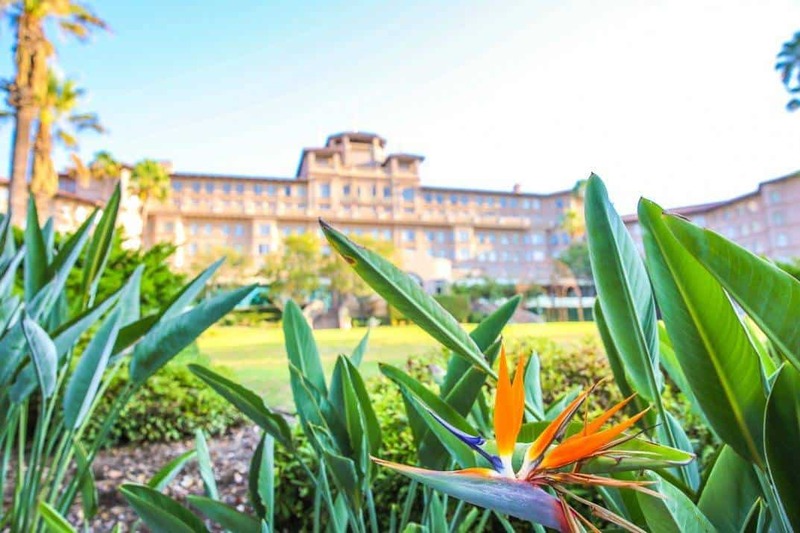 The resort is distinguished by its spectacular views and landscaped gardens, worth meandering adjacent to the pool area for a really enjoyable game of I-Spy. There’s an extensive tennis court area that outlines the private bungalows of the property and a charming vegetable and herb garden. There’s a main courtyard that offers a historic bell, rung every evening at 7:05 P.M. to honor the change of the day. Our kids waited to do the honors with a Langham staff member. The main courtyard is a peaceful place to sit for hours. The fitness center and spa are in a stand-alone building at the front entrance of the property. In addition to more common treatments, the Traditional Chinese Medicine inspired treatments of the Chuan spa are award winning and unique for all Langham Hotel spas. I went into the gym to do a cardio workout and stopped after three minutes. It was a crime to work out inside when such a property and area to explore were calling. I was the woman walking really, really fast through those gardens. 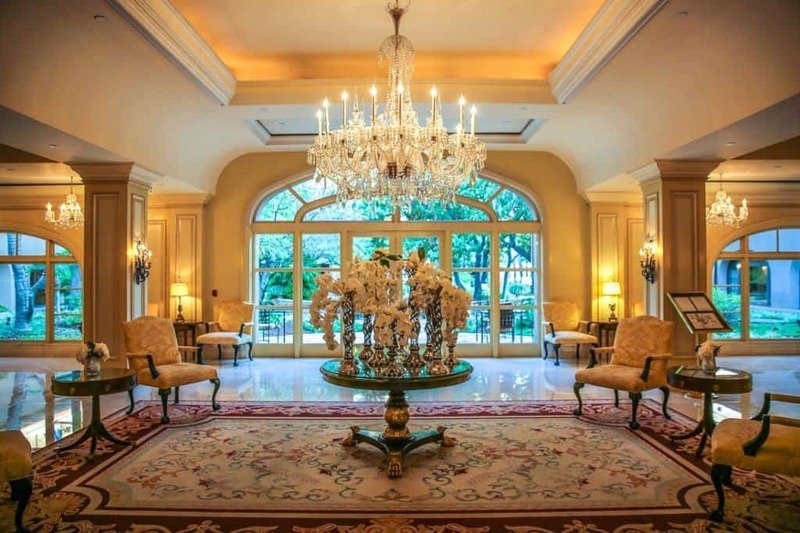 The rooms at The Langham Huntington recall the recent life of the hotel as a Ritz Carlton with traditional interior design. The rooms are incredibly spacious and our suite bathroom was the largest I think I’ve ever seen. Doubles are offered instead of two queens in rooms that have two beds. Suites or rollaways are best for families. Rooms and suites are generously sized. The room came with a Nespresso machine, but we were fortunate to enjoy club level access and I loved making coffee in the lounge instead. 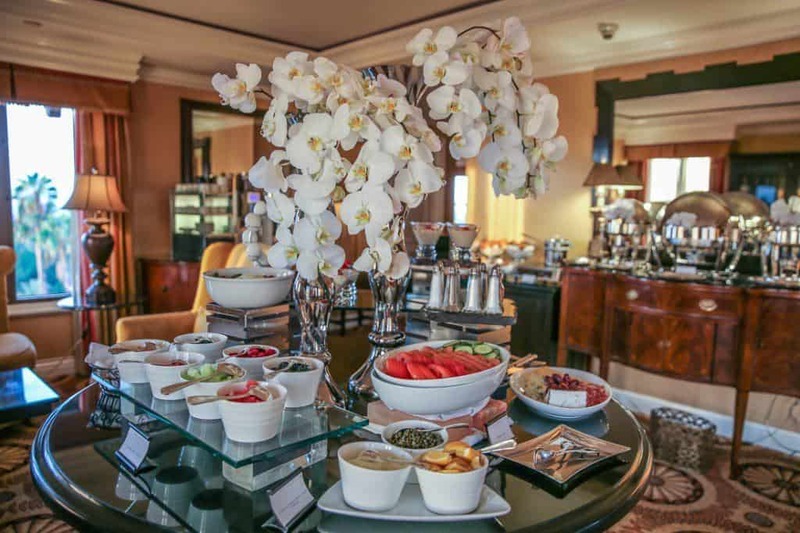 The Langham Huntington Club Lounge offers several daily food presentations, excellent coffees, wines, and desserts. 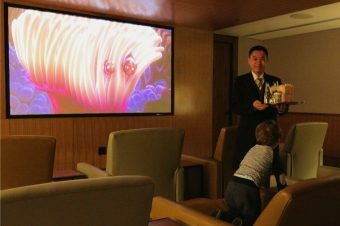 The club lounge experience at the Langham is what makes this a viable option for people who love club lounges for a bargain by comparison to the other luxe area hotels in Beverly Hills, downtown, and the beach areas. The food spreads were excellent with a thorough breakfast, sushi, composed salads, champagne at the ready, breakfast smoothies, and an industrial sized, but automated, Nespresso machine to make any guest a talented barista. Cookies and candy were available all day long, as well as a lending librbary of DVDs for guest rooms. The hillside location of the hotel makes beautiful views down to the Pacific Ocean from the lounge’s rooftop windows. And as the red terra-cotta tile roof stayed within view outside each window it kept making me crave a Kir Royale so that my aperitif could match it setting. The Langham Hotel of London was the first hotel to offer what we know as afternoon tea to the public. The Langham has partnered with Wedgwood to provide historically accurate china for their afternoon tea service at most of their properties. Mother daughter teas are just about as good as it gets, right? The Langham Chicago takes their tea service to the next level and offered an incredible popular Downton Abbey tea while the show was running that some women arrived in period costume. 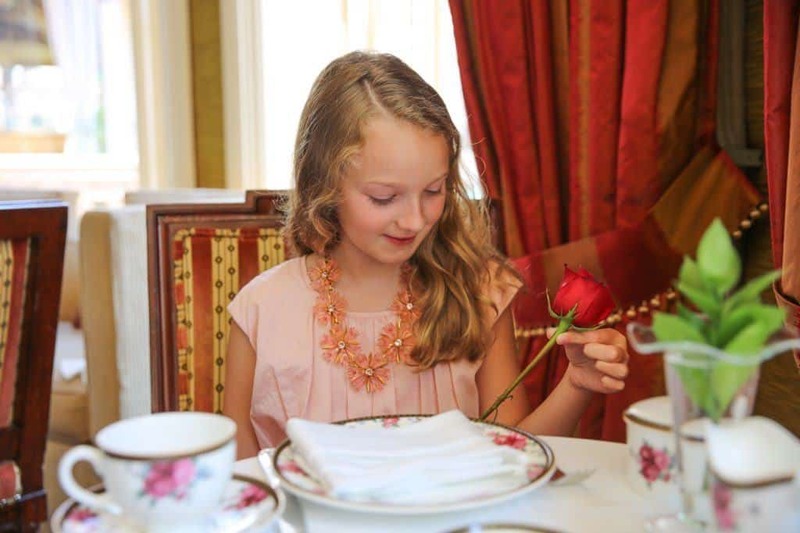 The Langham Huntington tea is great for kids. My daughter and I got to experience afternoon tea with sparkling elderberry flowers for her and pink champagne for me. The tea is great for families because, although it is elegant, the hotel’s vibe feels very family-friendly. Although we typically have tea as a mother-daughter experience I would have felt comfortable bringing my younger son as well. Servings were incredibly generous and artfully presented. I think we managed to eat one fourth of our tray. The tea is a very popular family choice at the holidays, so book far in advance. The Langham also hosts an Imagine Tea specifically for children featuring a magic act. Upcoming dates include March, June, and September, so call the hotel for details. The resort welcomes families with an adorable children’s reading library adjacent to the front desk to choose some reading during their stay. 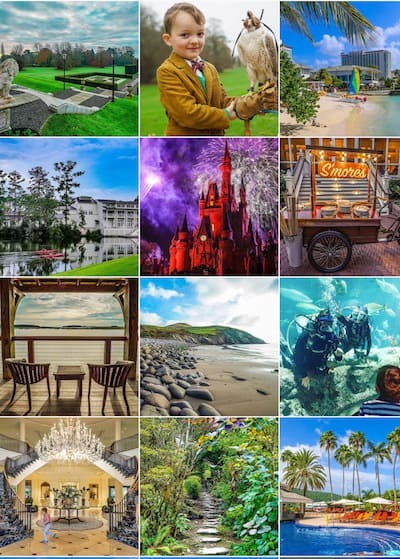 The resort also offers a family scavenger hunt in a passport book that directs children to different locations around the resort for a stamp, including the boutique where official Langham chocolate bars await them. The Langham Huntington offers a children’s reading library at check in. Genius. 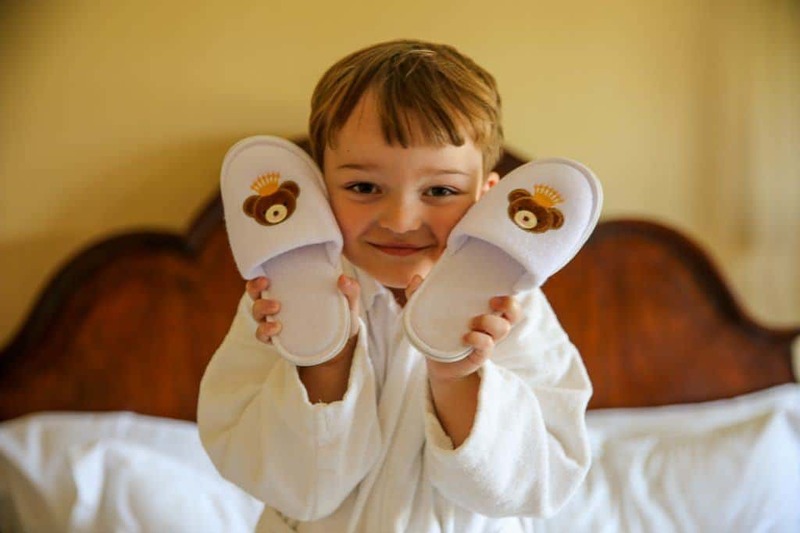 With notice that you are traveling with children (TIP: always give the hotel notice), staff can have robes and slippers in the hotel room adorned with Langham’s official mascot, teddy bear Theodore. 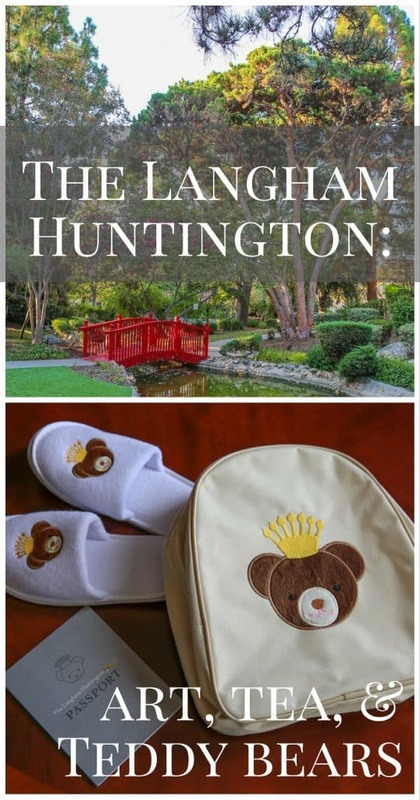 For a fee at check in, the Langham’s family program also includes adorable teddy bear backpacks. Each kit included a book from the nearby Norton Simon Museum of the alphabet corresponding to the museum’s collection. I love that the Langham family program seems to incorporate so effortlessly both fun and art, two of my own passions when traveling with our kids. 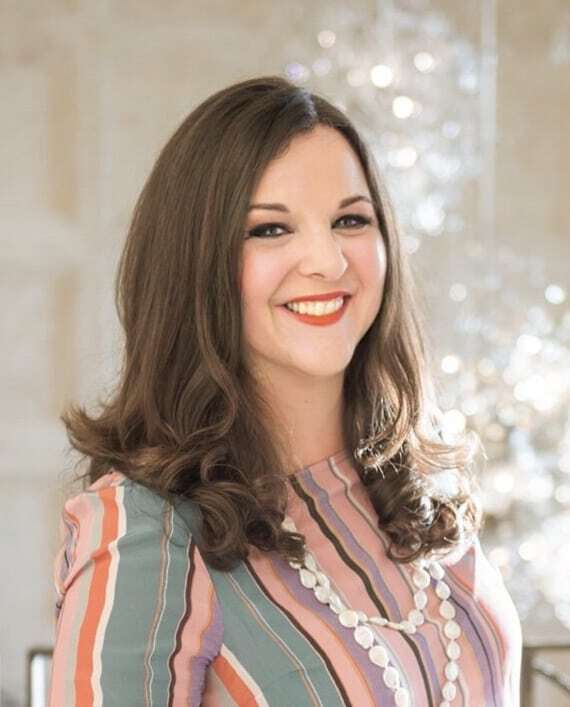 Their sister property in New York, The Langham Place, boasts an incredibly innovate Little Collector’s program for child-friendly gallery visits. The Langham Huntington mascot Theodore, the teddy bear. The only flaw with the Langham Huntington is that the pool area is somewhat small for the crowds in can gather during high season in the summer, particularly on warm weekends. The bridge separates the Langham Huntington pool area and the incredible Japanese gardens. Lounge chairs and tables added to accommodate the crowd were placed in the patches of dirt and grass where there was no concrete, so wet feet mixed with dirt means very muddy towels. The pool’s cooler was never refilled once it was empty of ice water, and poolside service was overwhelmed and slow. When we returned to the pool outside of the weekend we didn’t experience any of these issues. 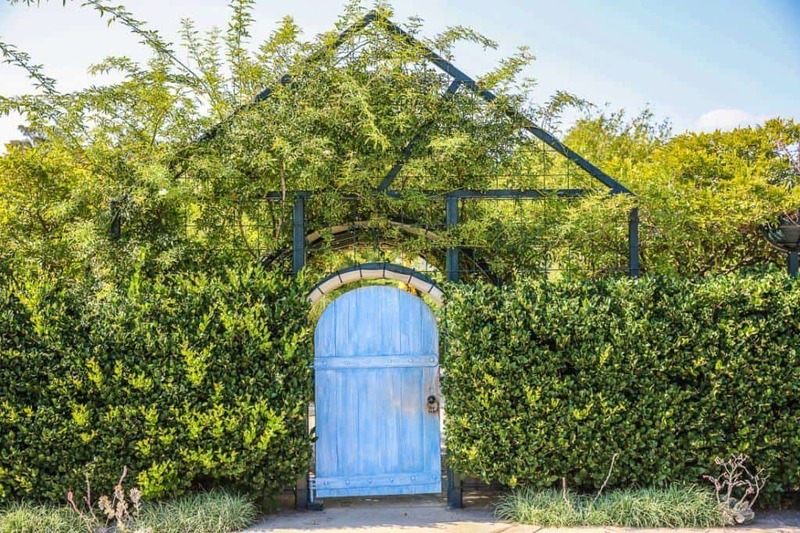 In addition to my favorable experience with the Langham brand, the nearby Huntington Library and Botanical Gardens is what drew me to this area as a weekend break. My husband was excited to see where members of Van Halen grew up. 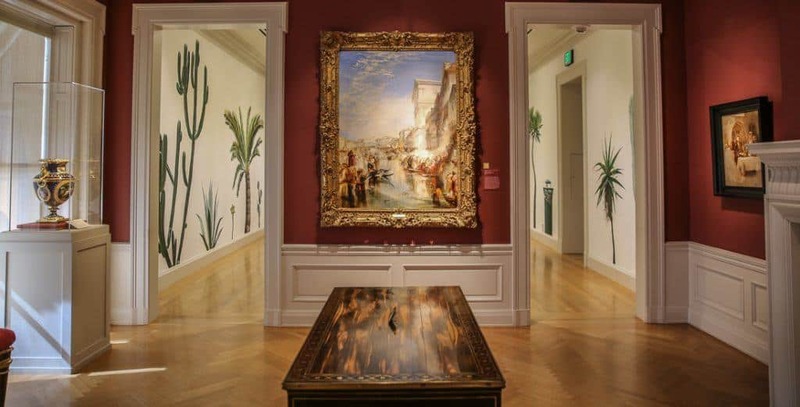 The Huntington offers a varied collection of art throughout a variety of buildings. What sounds like an Athenaeum is actually a large historic property with multiple buildings, original to the estate as well as many modern additions, dedicated to different art collections and different styles of gardens: desert, Chinese, Japanese, rose, jungle, and Shakespeare gardens. Ample space to take walks and strolls with kids. It’s absolutely a full days activity to explore with restaurants and a children’s garden and education center. The Children’s garden is more conceptual in design and will intrigue children, but not engage them any more than the other beautiful gardens. A little door in the Children’s Garden at the Huntington. The Huntington debuted a new wing housing the American collection of Jonathan and Karin Fielding in October of 2016. We feel we barely scratched the surface of the Huntington and didn’t even get to visit the nearby Norton Simon museum, another area museum that works well for children. So we will be tacking on a family art break again the next time we vacation in Los Angeles, and we’ll book another stay to the Langham Huntington. Breakfast in the club lounge, museums, alfresco lunch, pools, afternoon tea, repeat. Although we were guests of the Langham Huntington, these opinions are my own.